Interesting to see a young babe tonight with a high fever, or rather without a high temperature. 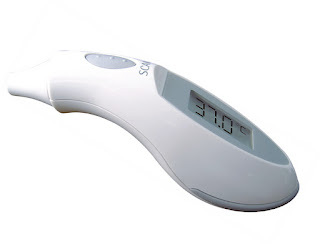 Mum had just acquired a thermometer, ordered from the internet and her 7 week old baby had a fever at 39 degrees. That sort of temperature in a babe of that age causes me some anxiety. However history taking suggested a perfectly well babe. Feeding voraciously, sleeping normally, responding to mum and happily asleep when examined. The temperature when taken by me was 36.4 degrees. I double checked with a colleague's thermometer-same 36 degrees temperature. Conclusion..a well babe with a poorly thermometer! How important it is that the old clinical skills are maintained in the contemporary practice of medicine when so much technology at our disposal. OK a thermometer isn't exactly a PET scanner, but the principle's the same. "You can't play pooh sticks on your own"